PitchPlus is ClickBank’s terminology for upselling to a customer who has just made a purchase. The Upsell product (or services) should complement or enhance or add-value to the customer’s initial purchase. These are the typical upsells that we encountered daily. Similarly, ClickBank offers its vendors a variety of Upsells and Downsells via its “PitchPlus” sales funnel. At its simplest, the ClickBank PitchPlus offers the customer a single upsell – if the customer accepts, then the sales funnel ends and the customer is sent to the confirmation page where he/she can download the initial product and the upsold-product. After initial purchase, customer is shown the 1st upsell. If customer accepts, the 2nd upsell is shown. If customer accepts the 2nd upsell, then the 3rd upsell is shown. At any point in the upsell-flow, if customer declines, then the “CB Confirmation Page” is displayed. On that confirmation page, the link to your thankyou/download pages will be displayed based on how many upsells the customer had purchased. After the initial purchase, the customer is shown the 1st upsell. If customer accepts, the “CB Confirmation Page” is displayed. But if customer declined the upsell, then the 1st downsell offer is shown. If customer accepts, then the confirmation page is displayed. But if customer declined the 1st downsell, then the 2nd downsell is displayed. If customer accepts (or rejects) the 2nd downsell, then the CB confirmation page is displayed. After the initial purchase, the customer is shown the 1st upsell. If customer accepts, then the 2nd upsell page is displayed. But if customer rejects, then the 3rd upsell page is displayed. In both cases above, whether the customer accepts or rejects the upsells, the CB confirmation page will be displayed with the appropriate download links, e.g. if customer had purchased the upsell, then the download link for that upsell will be shown. Otherwise, it will not be shown on the CB confirmation page. You’ll need to request for approval once it has been setup. Clickbank has to approve it (between 3-5 days, according to their website) before it can be used. Once it has been approved, the price of the upsells cannot be changed without going through the approval process again. Exit-pop-ups (or pop-under) are not allowed if the customer declined the upsell offer. Each upsell page can contain only 1 product for the customer to buy, i.e. the upsell page should not have multiple upsells/products. This is a quick tutorial on how to integrate MailChimp’s API version 3 with easyClickmate and easyClickGuard. The first thing you need to do is to get your MailChimp API key and the “list_id” for your list. 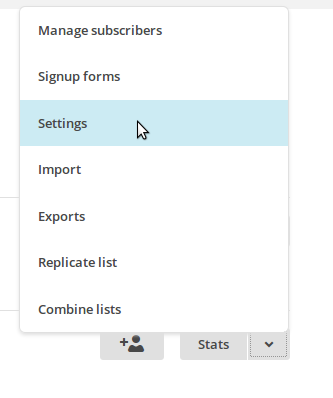 Each list that you create in MailChimp has a “unique identifier” called the ‘list_id’ which is diferent from the ‘list_name’. Click on the “Lists” tab in your MailChimp account. For example, in my account, I have a list called “customers”, and you may have a similar list called “customers” too. But both our lists (although have the same name) will have different/unique “list_id”. Insert “5” (for MailChimp) in the Autoresponder Type field. Then, insert the list_id is on the main dashboard page for each of the product that you want to integrate with MailChimp. Aweber: Integration is via the Email Parser, which unfortunately is not very reliable since many emails are caught in spam-filters, both at Aweber’s servers as well as your own host. Many of these servers uses the various RBL databases which blacklists IP addresses. GetResponse: Integration is via the older API version 1.x. Update the code for Aweber and Getresponse is not possible at this moment as I no longer have access to these accounts. For those using EasyClickGuard with Paypal, here’s how to setup the Paypal PDT (Payment Data Transfer) Auth/Identity Token. 2. Click the Profile subtab. 3. Click on the “My selling tools”. On the right panel, you will see “Website Preferences” Payment Preferences in the Seller Preferences. 4. Click on the “Update” – see the screenshot above. 5. You will then see the “Website Payment Preferences” page. Check (enable) the “Auto Return” radio button. 6. For the Return URL, enter the URL on your site that will receive the transaction ID posted by PayPal after a customer payment, OR, you can also specify the return URL when you create the payment button/code. 7. Scroll down to the Payment Data Transfer section of the page to view your PDT identity token. Note: There is a sample paypal buynow code in the zip file for easyclickguard. You can use that as a template to create your own buy now button. These “role-based” emails will be automatically deleted by Aweber’s mail servers. So, for those of you using easyclickmate or easyclickguard, make sure the email address in the “Control Panel” page is NOT a role-based email address. Otherwise, the automated email subscription will not work. There has been some subtle changes to the way Aweber handles email subscription via their Email Parser module. where ‘XXXXX’ is some numeric number. A critical security bug discovered in WordPress can cause an attacker to cripple not only your website, but the entire server your website resides on. This is due to the vulnerability in the PHP XML parser used by WordPress’ XMLRPC implementation. A reasonably skilled attacker can exploit this bug and cause your server to run out of memory simply by sending a 200+ KB XML file. If you are currently running WP 3.7 or WP 3.8 branch, please update to the latest .4 version. The following versions are patched against this security bug. Kindling – the Best Kindle Course! I’ve been rather ‘silent’ in the “IM” (Internet Marketing) world – and a number of friends and customers have asked if I’d fallen off the face of the earth ;-) … they are concerned of course! But no, I’m still around, and still actively supporting my software and providing server and VPS management. A good portion of my time now is spent on writing books for the Amazon Kindle Platform. I’ve 2 books out there at the moment (under a pen name) and will be releasing one under my own name soon. I’ve bought many courses (over 20) in 2013 alone, and the best one, in my humble opinion is The Kindling Course by Geoff Shaw. Unlike many other ‘Kindle guru wannabes’ who make money selling your their ‘get rich quick’ courses, Geoff is NOT an Internet Marketer. Ok, I know – the figures are nothing to shout about – but these are passive income. There is the initial “book marketing” work that has to be done when the books are first published, but once that has been done, it’s more or less plain sailing on autopilot. Geoff’s Kindling course covers everything – from niche selection, writing, fiction/non-fiction to marketing. If you are interested in creating real passive income with Kindle, this is the best course I’ve come across. The link above is a direct link, not my affiliate link! I truly believe in this course, and I’m happy to tell everyone about it without earning a single cent from it. If you want to earn some passive income in 2014 – Geoff’s Kindling Course is the way to go! Posted 11 January 2014 by Adrian Ling	in Kindle § Marketing | Comments Off on Kindling – the Best Kindle Course!